Today, Friday, October 7, 2016 marks the 100th anniversary of Georgia Tech’s crushing defeat of Cumberland College, 222-0, in 1916. Check out the following links, photos, and videos to learn more about this incredible game. Georgia Tech scored at least 42 points in every quarter (63, 63, 54 and 42). The Yellow Jackets scored 32 touchdowns, and Cumberland committed 15 turnovers (nine fumbles lost, six interceptions). Georgia Tech ran a relatively low 29 offensive plays, all rushes, for 501 total yards (17.3 yards per play). 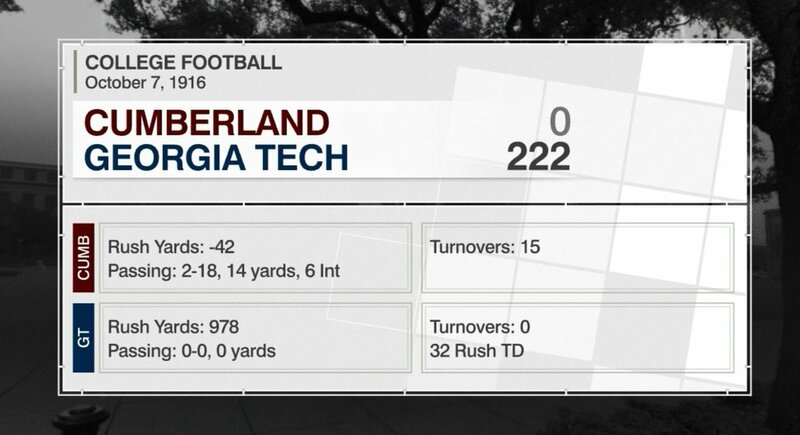 Cumberland finished with negative-28 total yards. Cumberland did not gain a first down. Georgia Tech had 20. Georgia Tech alum buys football from 222-0 victory and says he’ll give it to school, by Nick Bromberg, August 26, 2014, posted at Sports.Yahoo.com – Dr. Saturday! The ball had apparently been missing for decades. Georgia Tech is going to end up with a ball believed to be from its 1916 win over Cumberland. The game with a final score of 222-0 is the biggest blowout in college football history. The ball, with the final score inscripted on it, was up for auction and Ryan Schneider, a patent attorney and Georgia Tech alum won the ball over the weekend with a winning bid of $40,388. He’s giving it back to the school. Georgia Tech wanted the ball to begin with. But as the bidding on the item increased, Tech athletic director Mike Bobinski held off, not wanting to use athletic department funds. “That’s really the outcome we were hoping for all along,” Bobinski told the AJC. The coach of the 1916 Georgia Tech team was John Heisman, the man who the Heisman Trophy is named for. Schneider has been a season ticket holder for almost 25 years and said he only vaguely mentioned his desire for the ball to his kids before he found out he was the winning bidder Sunday morning. The ball had been in a box ever since a Los Angeles sports museum had moved in the 1980s. It only came out of storage for the auction, which benefitted the LA84 Foundation, a non-profit for youth sports in the Los Angeles area. The foundation had inherited the ball from the museum, which was founded in the 1930s. The ball from the Cumberland game is now on display at the Edge Center. You can read about that HERE. The following is a photo of the ball on display. A google image search for the game brings up some great photos and old newspaper clippings. This entry was posted in Heisman, History by Travis Normand. Bookmark the permalink.